Today's recipe is something that I didn't think was possible — an AIP Taco Seasoning Blend Recipe. One of the things that really spices up a meal (pun intended) is seasoning blends. With the right seasoning mix, you can turn plain meats, veggies, eggs, or a salad, into something really special. And one of our favorite seasonings is taco seasoning. However, if you're on the AIP diet, regular taco seasoning is out of the picture. 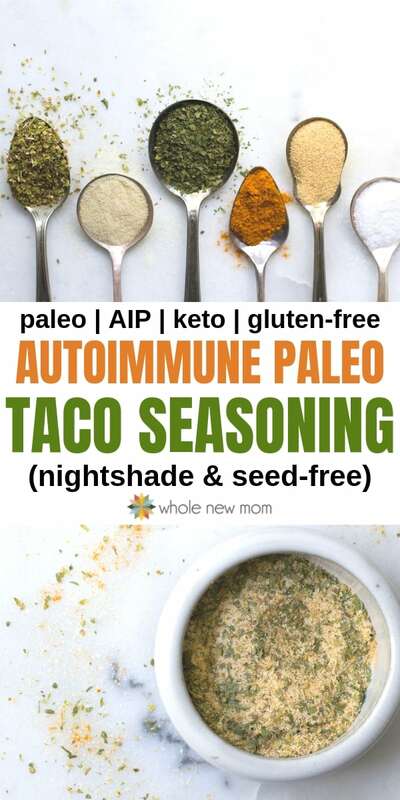 It's laden with peppers and seeds, both of which are off limits on the AIP diet, but I love all things taco, so I really wanted to develop this. It's been years since I have bought taco seasoning in the store — we actually buy very little processed food at all. Instead, we've used this Homemade Taco Seasoning for years, and it has served us well. 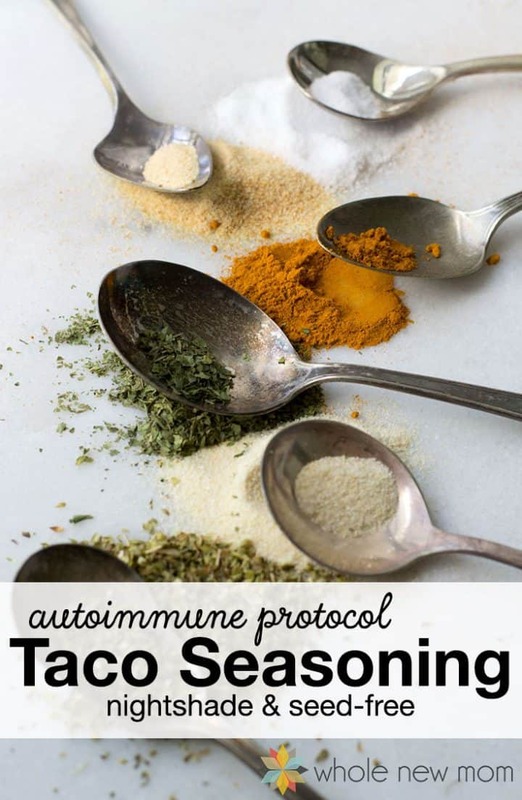 Problem is, that about a year ago, I started looking at the Autoimmune Protocol Diet (otherwise known as the Autoimmune Paleo Diet, or the AIP Diet, or AIP for short), and that changed everything. For those of you who don't know about the AIP Diet, it can be tough. I've been on a number of special diets over the years, but this one is just about the hardest one. My special diet journey started with my son's life-threatening food allergies that manifested themselves in severe eczema when he was an infant. I removed the top allergenic offenders from my diet so that the proteins wouldn't be present in my breastmilk, and his skin healed miraculously. Basically I removed wheat, egg, dairy, soy, fish, nuts, and peanuts from my diet. Tough, but doable. Then later, when it was clear that I had major issues with candida, I went on the candida diet. This was hard in a different way, but with alternative sweeteners like stevia, xylitol, erythritol, and the like, it's very manageable once you get rolling. I've tried GAPS for my oldest at one point. That was hard. And Paleo. Hard, but mostly tough since I have to always be mindful of the candida thing. 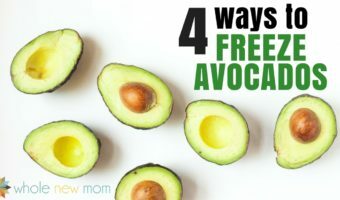 I'll tell you more later, but I ended up trying the AIP diet on the advice of a top blogger who knew of my struggles with Thyroid Disease and Adrenal Fatigue. She had done the AIP Diet for awhile and said it was a huge help, so I tried. And it was hard. 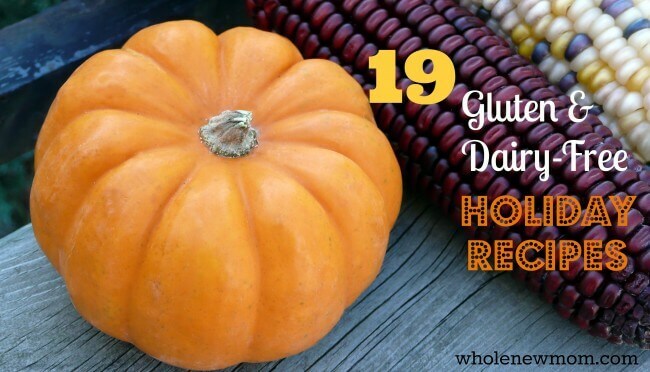 Again, mostly because I have the whole candida “thang” going on, which means you have to avoid loads of fruits, yucca, tapioca, cassava, and such things in excess, and they are the backbone of so much that is AIP. Spices are hard too since you technically are supposed to not eat nightshades or seeds, and so many of the lovely fragrant, intense spices are just those. Yup – all my favorites. Perhaps they are yours too? So — since I'm totally not into boooooring food, this recipe came about out of necessity for something really fun and tasty to spice up “meat and veggies.” Even though I am not totally following the AIP Diet right now, you never know when that might happen again, and I really wanted to have this in my back pocket. Plus, with the growth in autoimmune disorders in today's society (due to the perfect storm of gut health and overall health insults), I really wanted to make this available to those who are desperately trying to heal, but are finding their diet to be less than appealing. 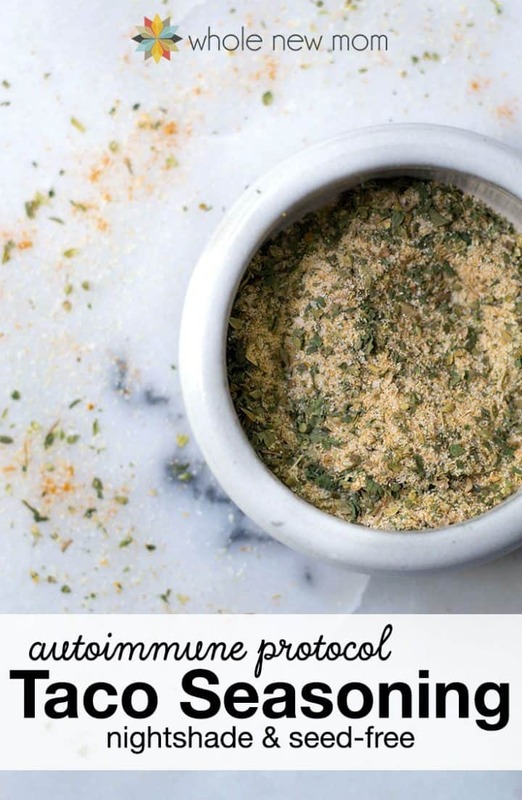 Whether you are on the AIP Diet or not, you will enjoy this blend — guaranteed. My youngest, in fact, told me it was the best seasoning I have ever made. Now, he might say that in a few months about another seasoning, but he really liked it. And that's a good sign :). Serve this on tacos (of course), on other meats, as the seasoning for Homemade Sausage Patties, on salads, veggies… really on anything savory. And if you're not grain-free you could have it on popcorn as well, or as a blend to put on Homemade Kale Chips. Oh, and while you're at it, here are great recipes for Grain-Free Taco Shells and Paleo Tortillas. So you're all set for your next AIP Mexican Fiesta :). For my spice shopping, I really like Frontier Brand. I've done taste tests with about 5 different brands, and Frontier Brand has won out every time and they are very reasonable. Starwest Botanicals, has really great spices too. 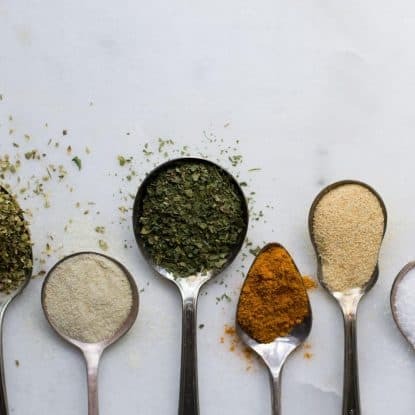 Make It Thicker: For a seasoning with a bit more “heft” to it, add about 1 tsp of a starch that is appropriate for your dietary needs to the mix. Make It Saucier: Add approx. ¾ cup water to the beef and seasoning mixture to make a more “saucy” beef. Save Time: As mentioned in my “Saving Time in the Kitchen by Baking in Bulk” post, I recommend making more of this in advance so that you have it on hand when you need it. Cook once, use two three four times or more :-)! Great on Everything: We even love this as a standby seasoning on our table. 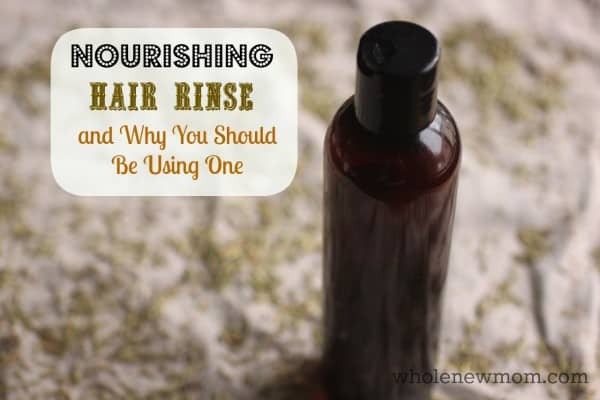 It tastes great on veggies and loads of other dishes! Use approximately 2 Tbsp taco seasoning mix for each pound of ground meat (or to taste, of course. Some people may prefer 1 Tbsp, others up to 4 Tbsp). As with other any other taco seasoning, either use the mixture as is, or add approx. ¾ cup water to the beef and seasoning mixture to make a more “saucy” beef. It's hard to give up things like tacos when you go on AIP. 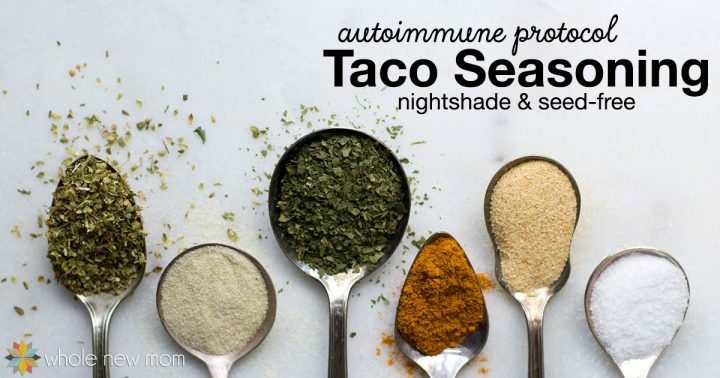 This autoimmune protocol taco seasoning is free of nightshades & seeds. Place all ingredients in a small bowl. Store in a tightly-closed container. What is YOUR favorite seasoning? How would you use this AIP Taco Seasoning? I find that the taste of dried cilantro is quite dull, so I prefer fresh or fresh-chopped-and-then-frozen cilantro. Do you find that the dried herb in this recipe retains flavor? Hi there. I agree with you on cilantro but in this case you don’t want a lot of cilantro flavor. Would be interesting in hearing what you think! I have been using this recipe to make tacos 2-4 times a month since October. Even after I could have peppers again, I continued using the recipe since it tastes better than packaged taco seasoning. After a few week break from tacos, I pulled up the recipe to make tacos for dinner tonight. I couldn’t figure out how I managed to measure wrong and was left with inedible, oversalted tacos. I looked back at a screen shot of your recipe that I had texted to my husband several months ago. Lo and behold, I did not measure wrong. The recipe used to say 1/2 tsp of salt rather than the 2 tsp now called for. I normally notice something off about a familiar recipe. 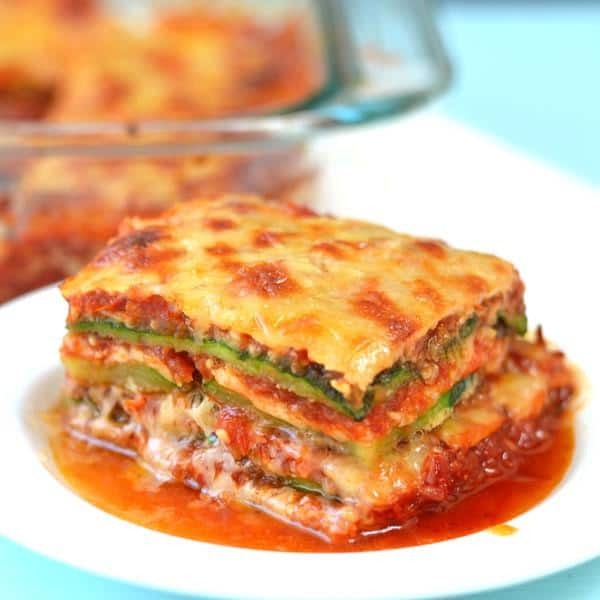 I am so glad I took a screen shot of the previous version of this recipe because it was fantastic. This version with 4 times the amount of salt, not so fantastic or edible for my palate. Hello Stacy! First of all, sorry for the delay in getting back to you. I’ve been so inundated and wanted to check on the issue here. Interesting that you had that screenshot! I guess it all comes down to taste. We made the recipe tonight using 1/2 tsp and it still needed salt on the dish we made (just ground beef on lettuce wraps with some lentils). How did you serve yours? We do like salt, however! I’m not sure what happened–possible that the import of the recipe messed up the 1/2 and made it a “2” instead. Things happen! But regardless I made it 1 tsp “or to taste” because at least for us we could have still used more salt. Thanks for filling me in and glad you enjoyed it overall.